Morris & Co was known for its innovative designs, command of artistry and traditional production techniques. Even in the technology-crazed world at the beginning of the Industrial Revolution, William Morris preferred to focus on the proven techniques of the past rather than the promises of mass production. The results not only retained the detail of the original art, but also created tapestries that have stood the test of time. 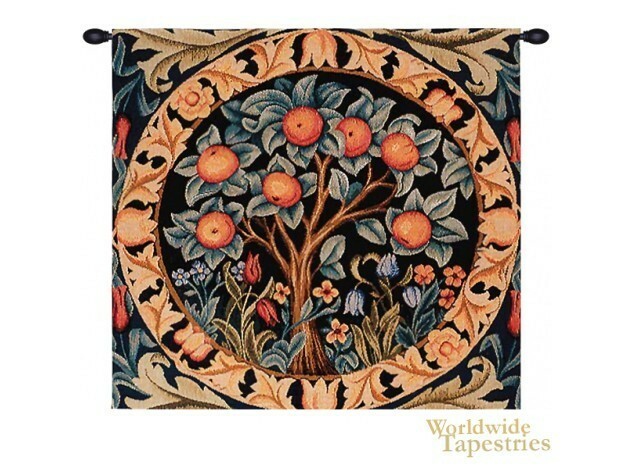 “The Orange Tree” is based on one of the finest examples of Morris & Co’s work. Woven in 1900, it was designed by in-house artist, John Henry Dearle (1860-1932). It was inspired by a larger original work, “The Orchard”. This tapestry is lined and has a tunnel for easy hanging. Note: tapestry rod and tassels, where pictured, are purchased separately. Dimensions: W 30" x H 28"